This Property is 100 Pct. Non-Smoking Discover first-rate lodging at the historic Hilton Fort Worth hotel in Fort Worth Texas. Business travelers and family vacationers alike will savor our spacious well-appointed accommodations including a luxury Presidential Suite and many fine features that are designed to enhance your travel experience. When you stay with us at our hospitable historic hotel you will enjoy such fine services and amenities as an onsite restaurant state-of-the-art fitness center concierge desk flexible meeting rooms business center and high-speed Internet access both wireless and wired. 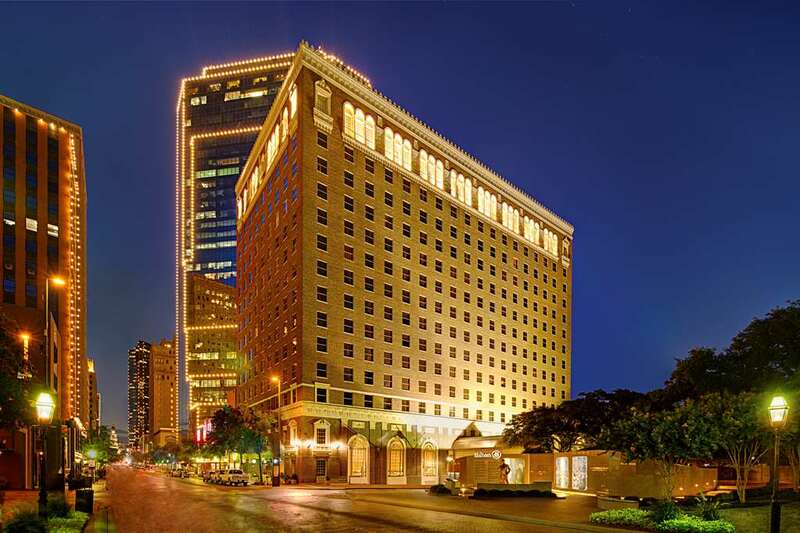 Our centrally located downtown Fort Worth hotel is convenient to just about everything. We*re within walking distance of the Fort Worth Convention Center and Sundance Square home to a fine collection of shopping dining and entertainment options. An array of popular attractions including the Fort Worth Stockyards Fort Worth Zoo Cowboys Stadium and several world-class art museums can be reached within a matter of minutes. And the bustling city of Dallas is only 35 miles due east on I-30. In addition the hotel is very close to transportation. Both Amtrak and the Trinity Railway Express are just a few blocks away. And if you*re flying in you*ll have several airports from which to choose including Fort Worth Meacham Airport /10 miles/ Dallas-Fort Worth International Airport /20 miles/ and Dallas Love Field /35 miles/. We look forward to having you as our guest at the Hilton Fort Worth hotel. Travel should take you places. Starbucks: Starbucks offers a selection of delicious warm pastries and sandwiches from La Boulange along with our signature beverages. Cafe Texas: Cafe Texas features elaborate buffet as well as a variety of menu items with a specialization in Southwestern cuisine with a flair. Del Frisco*s Steak House: Del Frisco*s Double Eagle Steak House embodies the rich tradition of fine American steakhouses amazing guests through our impeccable prime steaks seafood award-winning wine list and unparalleled hospitality. The Capital Grille: The Capital Grille is nationally acclaimed for dry-aged steak fresh seafood and extensive award-winning wine list presented with professional attentive service in an atmosphere of relaxed elegance.